Ex-Irish President Mary Robinson: U.S. Will Become Rogue Nation If Trump Pulls Out of Climate Deal | Democracy Now! Democracy Now! 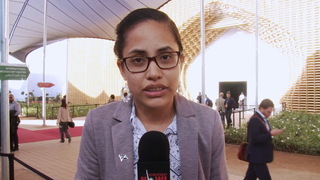 broadcasts from the United Nations climate talks in Marrakech, Morocco, where delegates from more than 190 countries are gathered to discuss how to implement the Paris Agreement from last year. But questions are swirling over the future of the deal following the election of Donald Trump, who has vowed to pull the United States out of the agreement and is a longtime climate denier. We are joined by Mary Robinson, who served as president of Ireland from 1990 to 1997 and U.N. high commissioner for human rights from 1997 to 2002. She is president of the Mary Robinson Foundation–Climate Justice. AMY GOODMAN: We are broadcasting from Marrakech, Morocco, the site of the U.N. climate talks, or COP 22, the Conference of the Parties. Delegates from more than 190 countries are gathered here discussing how to implement the Paris Accord from last year. But questions are swirling over the future of the deal following the election of Donald Trump, who has vowed to pull the United States out of the agreement. Trump is a longtime climate denier. On Wednesday, China’s vice foreign minister rejected Trump’s claim that global warming is a Chinese hoax. Instead, Liu Zhenmin pointed out that international climate change negotiations began with the support of Republicans during the late 1980s. Meanwhile, Secretary of State John Kerry gave a major speech here in Marrakech yesterday. He referenced the election but did not mention the president-elect by name. SECRETARY OF STATE JOHN KERRY: Obviously, an election took place in my country. And I know it has left some, here and elsewhere, feeling uncertain about the future. I obviously understand that uncertainty. And while I can’t stand here and speculate about what policies our president-elect will pursue, I will tell you this: In the time that I have spent in public life, one of the things I have learned is that some issues look a little bit different when you’re actually in office compared to when you’re on the campaign trail. And the truth is that climate change shouldn’t be a partisan issue in the first place. It isn’t a partisan issue for our military leaders at the Pentagon, who call climate change a threat multiplier. AMY GOODMAN: That’s Secretary of State John Kerry speaking here in Marrakech. Well, to talk more about the climate talks and the election of Donald Trump, we’re joined by Mary Robinson. She served as president of Ireland from 1990 to ’97 and U.N. high commissioner for human rights from ’97 to 2002. She is president of the Mary Robinson Foundation–Climate Justice. MARY ROBINSON: Thank you, Amy. And happy Climate Justice Day, the first Climate Justice Day at any COP. AMY GOODMAN: Well, congratulations also on your new appointment, which is what? MARY ROBINSON: El Niño and climate, as the special envoy of the secretary-general, looking at the fact that El Niño is very severe now, and we think it’s impacted by climate change, in a way that we don’t fully understand, but it’s devastating for about 60 million people worldwide. AMY GOODMAN: So, you were the high commissioner for human rights. You were the president of Ireland. Why is climate justice your issue? MARY ROBINSON: Because I’ve seen that climate change is undermining human rights all over the world and that people have to become much more resilient to be able to cope with that problem and that we need to be more people-centered in what we’re doing and recognize that all climate action has to respect all human rights. AMY GOODMAN: You know, we came from the United States to Morocco to focus on this issue of climate justice, and particularly to bring out the voices of people here. Thousands come from around the world to deal with an issue that’s in dispute in the United States, particularly when it comes to the president-elect. President-elect Donald Trump says he’s going to pull out of the Paris Accord. Your response? MARY ROBINSON: My response is that I’m very encouraged by the steadiness here at the COP, to be honest, and governments are determined to go ahead, absolutely determined. Civil society, business, cities, young people, women—everybody is saying this is far too serious. The world came to a Paris Agreement of 195 countries last December. And we’re now implementing, and steps are being taken here in the COP to implement. And that will go on and must go on. It is extremely important that we implement the two big agendas of last year: the Sustainable Development Goals, with its goal on climate change, and the Paris Agreement, saying we have to be well below 2 degrees Celsius of warming and try to get 1.5. That’s well below 3.6 degrees Fahrenheit. That’s going to be a tough agenda for the world. And that’s what is front and center here at the COP. AMY GOODMAN: What if Donald Trump pulls out? What will that mean for the United States? What would be your response to that? MARY ROBINSON: The first thing is, I think it would damage the image and reputation of the United States globally, because the United States signed up to this important agreement—in fact, gave great leadership. Both President Obama and Secretary of State Kerry have given great leadership on climate, together with China and other major emitters, and were forceful in ensuring we got the agreement and were willing to have the ambitious goal that is in the Paris Agreement. If one country were to renege now on that, I think it would damage that country’s reputation internationally. You know, that’s the truth of it. It would not stop the agreement from going forward, not at all, because in the United States, you have cities—I was honored recently by Chicago. And, you know, I was looking at Chicago’s role as one of the C40 cities. I know New York is the same. Look at California. AMY GOODMAN: What do you mean, C40? MARY ROBINSON: The C40 is a connection of cities on climate. And Chicago is determined to be a leader on that, to cut emissions, to have an inclusive approach in the city, to talk about it a lot and to be part of the way forward in renewable energy that will create jobs in Chicago. AMY GOODMAN: You have said that if Donald Trump pulls out, it would make the U.S. a rogue nation. Do you stand by that? MARY ROBINSON: I said “a kind of rogue nation,” because, you know, how can you sign up to something that’s so important for the world, that the world knows is real and happening, and then, somehow, because somebody is blind to or pretends to be blind to the consequences because of the lobbies that are surrounding him—I’m afraid that that just is not acceptable to the world. And what I’m—what I’m worried about is the damage to, you know, the kind of role of leadership on values of the Universal Declaration of Human Rights. The United States has its own problems with human rights, but it’s always been a leader in promoting these values and gender equality and other values. And many of these are more at risk, especially in the United States. And it’s their problem more than a problem for the world, which will go ahead with the climate agreement.